Grass pitch near Old Gym was lit with candle jars and above our heads were the fairy lights hanging just like in a story book. The antique yet grandeur motor bike was placed at the entrance giving us the vibes of what to expect inside. With that splendid start, it didn’t take more than 5 minutes for us to feel as we are in the golden era of music. True, there were true stake holders of that era presented in the audience, but we doubted who enjoyed it more! While some in audience whispered the tunes of Milton’s, others danced to Clarence’s. Nevertheless, the stage was exploding in glitter with big wigs, bell bottoms and gaudy sarees all performing to fast beats from past. Amidst the exams, it was an audience of multi-faculty trying to imagine what was it like to live in times of our parents and grandparents. No argument, the stage drama helped us a lot in it! Moreover, that would not have been achieved without the talented music band on stage which comprised of our own university brothers. 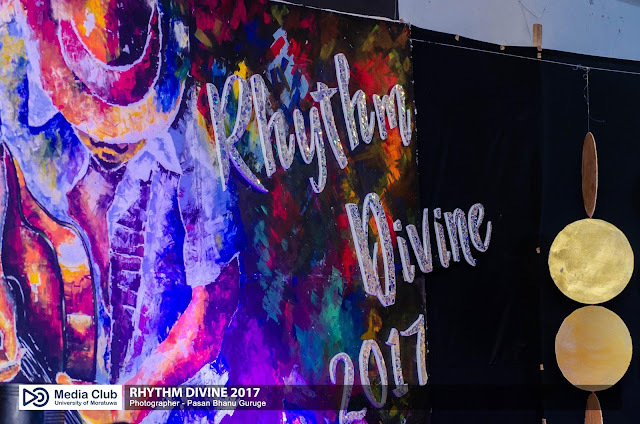 This was a glimpse of what we experienced at Rhythm Divine 2017, the annual talent show of Department of Transport and Logistics Management organized by Society of Transport and Logistics. If you missed this special evening, do not worry, below are some moments that we were able to catch in our camera eye.